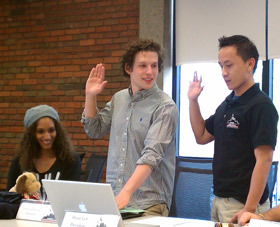 Outgoing Day Student Body President Houa Lor [right] did the swearing in for new Day Student body President Patrick DuSchane [center] and new Day Student Body Vice President AuBrianna Weatherspoon [left]. Thanks to Houa and outgoing Vice President Erik Grindal. Congratulations toAugsburg’s new 2012-2013 Day Student Government.